Abstract: An eosauropterygian skeleton found in the Middle Triassic (upper Anisian) Gutenstein Formation of the Fatric Unit (Demänovská dolina Valley, Low Tatra Mountains, Slovakia) represents the earliest known occurrence of marine tetrapods in the Western Carpathians. The specimen represents a partly articulated portion of the postcranial skeleton (nine dorsal vertebrae, coracoid, ribs, gastral ribs, pelvic girdle, femur and one zeugopodial element). It is assigned to the Pachypleurosauria, more precisely to the Serpianosaurus–Neusticosaurus clade based on the following combination of features: (1) small body size; (2) morphology of vertebrae, ribs and femur; (3) tripartite gastral ribs; and (4) microanatomy of the femur as revealed by μCT. Members of this clade were described from the epicontinental Germanic Basin and the Alpine Triassic (now southern Germany, Switzerland, Italy), and possibly from Spain. This finding shows that pachypleurosaur reptiles attained a broader geographical distribution during the Middle Triassic, with their geographical range reaching to the Central Western Carpathians. Pachypleurosaurs are often found in sediments formed in shallow, hypersaline carbonate-platform environments. The specimen found here occurs in a succession with vermicular limestones in a shallow subtidal zone and stromatolitic limestones in a peritidal zone, indicating that pachypleurosaurs inhabited hypersaline, restricted carbonate ramps in the Western Carpathians. Abstract: Detrital garnets and rutiles have been recovered from basaltic pyroclastic rocks in the northern part of the Pannonian Basin and characterized using electron probe microanalysis and imaging. All garnets are dominated by the almandine component, except for one sample dominated by spessartine. A total of three garnet groups have been distinguished according to the increased contents of grossular (Group I), pyrope (Group II) and spessartine components (Group III). Compositions of the group I and II garnets with fluctuating Ca- and relatively low Mg contents are consistent with low- to medium-grade metasediments and/or metabasites. Locally increased Mg contents could indicate higher P–T metamorphic overprint. The dominantly metamorphic origin of the Group I and II garnets (composed of > 99 % of samples) is also corroborated by chlorite, tourmaline, staurolite, ilmenite and andalusite inclusions. Spessartine-rich garnets (Group III composed of < 1 % of samples) could be genetically linked with granitoids. Detrital rutiles invariably plot within the field of metasediments metamorphosed under amphibolite-facies conditions. Possible proximal (subjacent basement sampled by ascending lava) or distal sources (catchment sediments from uplifted Central Carpathian basement) of heavy mineral assemblages are discussed. Abstract: This paper describes the section and fossil content of a former gravel pit in the Eastern Styrian Basin (SE Austria), which exposes sediments of a fluvial system, ranging from within channel to overbank environments. A predominately terrestrial gastropod fauna of 15 species so far, was recovered from a palaeosol formed in a moist and vegetated, floodplain or abandoned channel. Up-section, a shallow freshwater pond/lake developed within the floodplain, settled by fishes, molluscs and ostracods. By integrating regional geological and biostratigraphical data derived from the terrestrial gastropod fauna as well as from the other recovered biota, these strata are of late middle Miocene (late Sarmatian s.str.) age. Hence, this fossil site provides a rare insight into the terrestrial habitats in the hinterland of the Sarmatian Sea and their biota, which are otherwise barely known in Central Europe. Abstract: The maceral and biomarker characteristics of 4 sublithotypes of xylite-rich coal (SXCs), pale yellow, dark yellow, brown and black, originating from the Kolubara and Kostolac lignite basins were determined. Based on these results, differences in sources and changes of organic matter (OM) resulting in formation of 4 SXCs were established. Conifers (particularly Cupressaceae, Taxodiaceae and Pinacea) had a significant impact on the precursor OM of all SXCs. The contribution of gymnosperm vs. angiosperm vegetation decreased in order pale yellow SXC > dark yellow SXC > brown SXC > black SXC. The distribution of non-hopanoid triterpenoids indicates that change of SXC colour from yellow to black is associated with reduced input of angiosperm plants from the Betulacea family. Differences in hopane distribution, bitumen content, proportion of short-chain n-alkanes and degree of aromatization of di- and triterpenoids of pale yellow SXC are controlled by microbial communities which took part in the diagenetic alteration of OM. The content of total huminites increased from black to pale yellow SXC, whereas contents of total liptinite and inertinite macerals showed the opposite trend. SXCs differ according to textinite/ulminite ratio, which sharply decreased from pale yellow to black SXC, reflecting increase in gelification of woody tissue. Regarding the composition of liptinite macerals, the SXCs mostly differ according to resinite/liptodetrinite and resinite/suberinite ratios, which are higher in yellow than in brown and black SXC. This result along with values of TOC/N ratio and Carbon Preference Index indicate that the contribution of well preserved woody material, including lignin tissue vs. the impact of epicuticular waxes decreased from yellow to black SXC. Abstract: Deep-sea channels are one of the architectonic elements, forming the main conduits for sand and gravel material in the turbidite depositional systems. Deep-sea channel facies are mostly represented by stacking of thick-bedded massive sandstones with abundant coarse-grained material, ripped-up clasts, amalgamation and large scale erosional structures. The Manasterz Quarry of the Ropianka Formation (Upper Cretaceous, Skole Nappe, Carpathians) contains a succession of at least 31 m of thick-bedded high-density turbidites alternated with clast-rich sandy debrites, which are interpreted as axial deposits of a deep-sea channel. The section studied includes 5 or 6 storeys with debrite basal lag deposits covered by amalgamated turbidite fills. The thickness of particular storeys varies from 2.5 to 13 m. Vertical stacking of similar facies through the whole thickness of the section suggest a hierarchically higher channel-fill or a channel complex set, with an aggradation rate higher than its lateral migration. Such channel axis facies cannot aggrade without simultaneous aggradation of levee confinement, which was distinguished in an associated section located to the NW from the Manasterz Quarry. Lateral offset of channel axis facies into channel margin or channel levee facies is estimated at less than 800 m. The Manasterz Quarry section represents mostly the filling and amalgamation stage of channel formation. The described channel architectural elements of the Ropianka Formation are located within the so-called Łańcut Channel Zone, which was previously thought to be Oligocene but may have been present already in the Late Cretaceous. Abstract: Two coarse-grained Gilbert-type deltas in the Lower Badenian deposits along the southern margin of the Western Carpathian Foredeep (peripheral foreland basin) were newly interpreted. Facies characterizing a range of depositional processes are assigned to four facies associations — topset, foreset, bottomset and offshore marine pelagic deposits. The evidence of Gilbert deltas within open marine deposits reflects the formation of a basin with relatively steep margins connected with a relative sea level fall, erosion and incision. Formation, progradation and aggradation of the thick coarse-grained Gilbert delta piles generally indicate a dramatic increase of sediment supply from the hinterland, followed by both relatively continuous sediment delivery and an increase in accommodation space. Deltaic deposition is terminated by relatively rapid and extended drowning and is explained as a transgressive event. The lower Gilbert delta was significantly larger, more areally extended and reveals a more complicated stratigraphic architecture than the upper one. Its basal surface represents a sequence boundary and occurs around the Karpatian/Badenian stratigraphic limit. Two coeval deltaic branches were recognized in the lower delta with partly different stratigraphic arrangements. This different stratigraphic architecture is mostly explained by variations in the sediment delivery and /or predisposed paleotopography and paleobathymetry of the basin floor. The upper delta was recognized only in a restricted area. Its basal surface represents a sequence boundary probably reflecting a higher order cycle of a relative sea level rise and fall within the Lower Badenian. Evidence of two laterally and stratigraphically separated coarse-grained Gilbert deltas indicates two regional/basin wide transgressive/regressive cycles, but not necessarily of the same order. Provenance analysis reveals similar sources of both deltas. 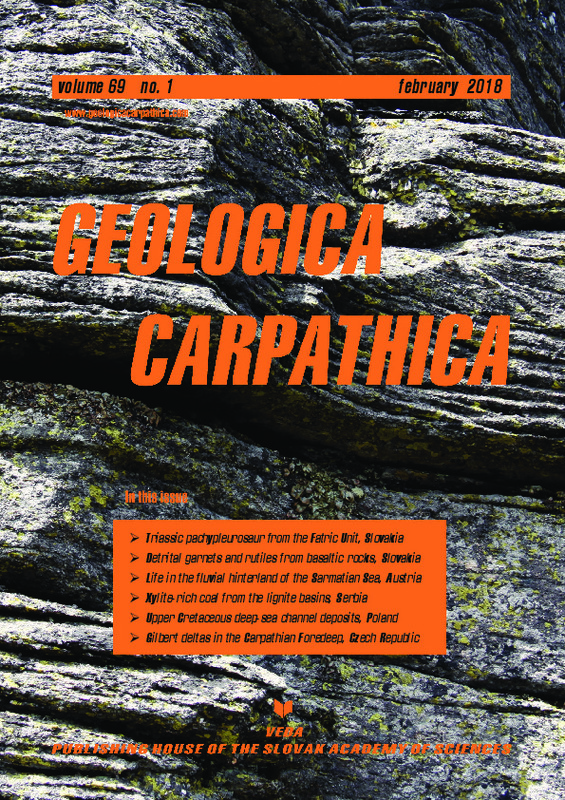 Several partial source areas were identified (Mesozoic carbonates of the Northern Calcareous Alps and the Western Carpathians, crystalline rocks of the eastern margin of the Bohemian Massif, older sedimentary infill of the Carpathian Foredeep and/or the North Alpine Foreland Basin, sedimentary rocks of the Western Carpathian/Alpine Flysch Zone).